The Chinese Lunar calendar-themed coins have emerged as the largest and perhaps most diverse coin program in the world in recent years. But for the modern world coin collector that results in such a dizzying range of coins, sometimes even from one country, that it is hard to decide which ones are worth getting. In addition, some animals seem to result in more attractive art work than others. The 2015 year of the goat coins have been more challenging in this regard but have already been rendered very nicely in Perth's bullion and collector coins, the 5 oz gilded Niue issue made by Pamp in Switzerland with a mintage of 500, and others. 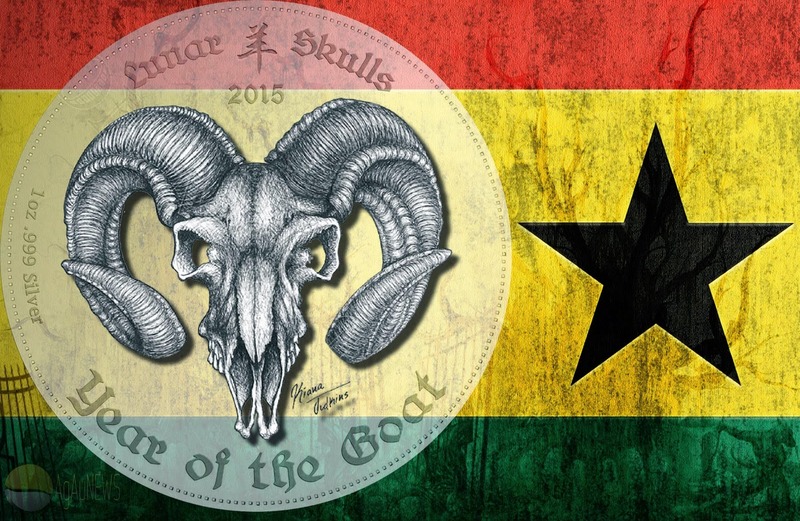 But now there is a totally original take on the Lunar theme from the country of Ghana with the first coin in a new series of a more macabre nature that depicts the skulls of the animal. 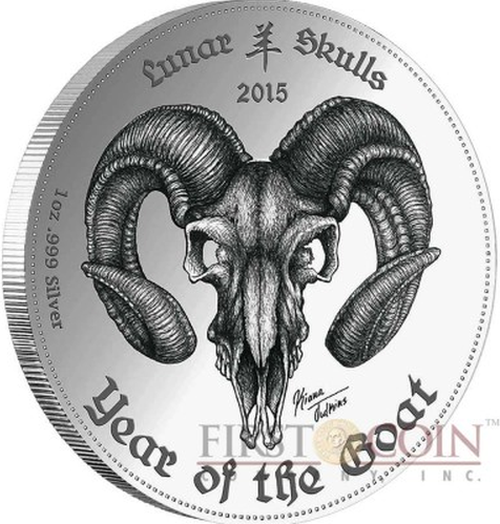 The 2015 Lunar Skulls goat issue is being minted by an e-Bay dealer named Son-Montuno, who specializes in modern world coins, who decided to establish his own private mint to produce this series. It will be a 12-coin series, and first year releases are often the most sought after. The skull coins, which will be minted in high relief, and issued in low mintages in BU (2,000 coins) and especially in proof (just 500 coins), have really struck a chord with many collectors, even though they will only be issued in January, which means buyers have only line art drawings to go by for now. The coins were produced with the assistance of SMmint.com and were designed by U.S. tattoo artist, Kiana Roo, whose signature appears on each coin. Each coin is also individually numbered on the rim, and the number on the certificate of authenticity will match that on the coin. This is a feature many collectors find appealing. It is hard to say exactly why these coins have become popular so quickly, but it is not terribly surprising given the success of the Zombucks and similar limited edition rounds sold by Provident Metals, which sell for solid premiums over the issue prices. At the recent Whitman Expo in Baltimore, Maryland I ran into a dealer who said she was particularly taken with the Feast dollar, a macabre version of the famous Peace dollar. Zombucks is billed as "the currency of the apocalypse" by Provident. with his half of the mintage, with the other half going to his business partner. Each dealer who buys coins to sell retail will only receive 10 coins in most cases. This method of distribution is one of the reasons prices for the coins in proof have taken off so quickly, though auction results have also been uneven. Pre-orders for the proofs began on November 22 at $89, there were many sales in the $150 range, and by the 24th they reached $199. Then auction prices started going much higher reaching $596 on the 30th. But on December 6 someone got a proof for only $255, still a healthy increase from the initial price, but a fraction of more recent sales. From what I have read and heard from other collectors it is clear that some buyers quickly realized the proof coins represented a good value at $89-$150 and appear to have purchased extras to sell at a profit. It remains to be seen whether by January the proof coins will still bring $600-700, but $300 seems like a reasonable prediction. A lot will depend on how the coins look in person, and on the extent to which buyers decide to sell their extra coins, or keep them to see how prices develop. Why should you be interested in this coin? Highly limited (2,500 coins maximum/ ONLY 500 PROOF). Three nines fine silver (99.9% pure silver). First coin of a new series w/ unique serial # engraved on coin with matching COA.